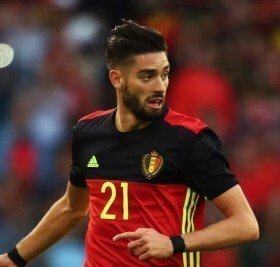 Arsenal have reportedly opened a dialogue with Chinese Super League side Dalian Yifang to secure the services of Yannick Ferreira Carrasco. The Belgium international only made the switch to the Far East last winter but he is keen on a European comeback before the transfer window closes across the continent's main leagues. According to Sky Sports News, the Gunners have stepped up their interest in signing the attacker, who was previously in the ranks of Spanish heavyweights Atletico Madrid. However, the club still have a potential stumbling block with regards to the transfer terms, given the hierarchy have made it clear that they won't entertain permanent signings in the current month. Arsenal have already reached a loan agreement to sign Denis Suarez from Barcelona this month and an announcement is expected in the next few hours with both clubs satisfied with the move. Aside from Suarez, the club have recently approached for Inter Milan's Ivan Perisic but a deal appears unlikely with the Nerazzurri wanting an obligatory buy clause which the Gunners are refusing to commit to.